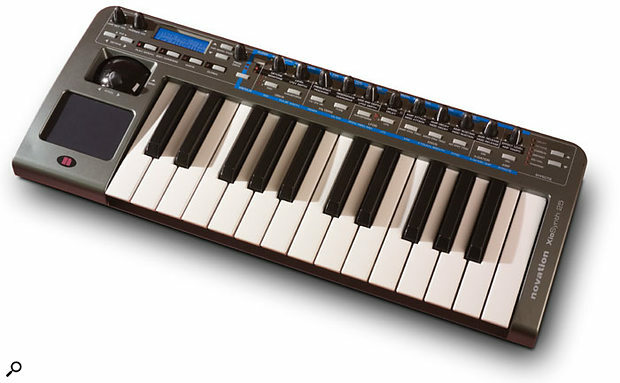 Novation's Xiosynth is several products in one. It combines a flexible MIDI controller keyboard, an eight-voice polyphonic synth with on-board FX, and a two-in two-out USB audio interface, in a very competitively-priced package. The Xiosynth is available in 25-key and 49-key versions, which are identical apart from the number of keys (we'll be focusing on the 25-key model in this review). The 25-key version measures 468mm x 68mm x 190mm — about the same amount of desk space required for a full-sized QWERTY keyboard. The Xiosynth features a high-quality 'semi-weighted' keyboard (just like Novation's Remote LE) that feels nicely solid and responsive. Like the Remote LE, and unlike Novation's more expensive controllers, it doesn't provide aftertouch sensitivity, but the internal synth engine does respond to aftertouch data. The top panel is home to 14 knobs (13 pots, one rotary encoder) and a couple of dozen multi-function buttons, whose meanings change according to which of the Xiosynth's modes you're working in. There's also a two-line by 16-character LCD with an attractive blue backlight. At the left-hand end of the keyboard there's a combined pitch-bend and modulation joystick, and an X/Y touchpad reminiscent of a laptop trackpad. The joystick is spring-loaded in both directions, and this is not adjustable (Novation's more upmarket controllers allow spring-loading to be disengaged for forward-backward modulation movements). Moving on to the back panel, there are two audio inputs: one quarter-inch jack and one XLR, the latter supplying phantom power (12, 24 or 48 Volts) to condenser mics that require it. Four additional quarter-inch jacks are provided for stereo audio output, headphone output and for attaching a sustain pedal (not supplied). There's one standard MIDI output, but no inputs. A standard USB connector is used for data transmission, and can also be used to power the unit. Another socket allows a 9V DC adaptor to be used instead, and this adaptor is supplied — although the review model came with a two-pin mains plug and required the use of an adaptor in the UK. The unit can also be powered by six 'AA' batteries, and a three-position power switch allows you to select USB power, battery or external DC current, or to switch the unit off. The Xiosynth ships with the brief Getting Started Guide, which is little more than a brochure, and a resources DVD-ROM. On the DVD there's a PDF version of Getting Started Guide, and a PDF of the more detailed User Guide. It's a pity that a proper printed version of User Guide isn't included, as the Xiosynth is complicated enough to send new users running for the manual fairly frequently. A series of video tutorials is also included on the disc. These tutorials are well made and well presented, but don't go into much detail. It seems as if Novation have decided that, since most users don't bother with printed manuals, their efforts are better focused elsewhere. They may be right — but I still would have liked a printed a manual. The Xiosynth can be used in two distinct modes. In Synth mode, it works as an eight-voice polyphonic, monotimbral synthesizer. In Play mode, it works as a flexible MIDI controller, very much like the Remote LE. In addition to the basic Play and Synth modes, the Xiosynth also has a couple of 'hybrid' modes, which allow you make more selective use of its MIDI control and synthesis capabilities. For example, you might choose to use the keyboard and joystick to control the internal synth, while using the Xiosynth's knobs, buttons and touchpad to control MIDI software or external hardware. Or you could set the internal synth to be triggered by data from a MIDI sequencer, while using the Xiosynth's knobs and buttons to control other external parameters. As with the Remote LE, templates are the key to getting the best out of the Xiosynth's MIDI control capabilities. A template is a kind of patch or program consisting of a collection of knob and controller assignments, and a number of preset templates are provided, tailored to suit the parameters of a number of popular instruments, plug-ins and applications. A complete list of these can be found on Novation's web site (www.novationmusic.com). To control a V-Station plug-in, for example, you can simply select the 'V-Station' template and the Xiosynth's knobs and buttons will be instantly mapped to the appropriate V-Station parameters. When you want to control another instrument, just switch to a different template. You have plenty of flexibility to create your own templates, with almost every aspect of the controller's behaviour being adjustable. The assignable knobs and buttons can send every conceivable form of MIDI data, and the exact behaviour of individual controls ('Jump' and 'Pickup' knob modes, for example) can be easily altered. Up to four different target parameters are assigned to the X/Y touchpad alone, allowing for all kinds of creative experimentation. 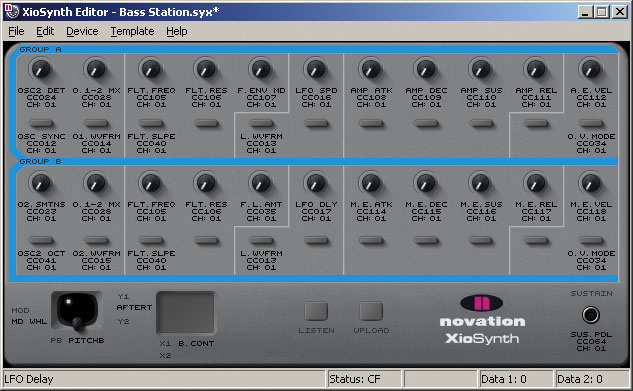 New templates can be created, edited and stored without too much difficulty from the Xiosynth's front panel. Novation also provide some simple template-editing software (for Windows and OS X) which makes editing templates somewhat easier. Note that this software is only used for editing MIDI control templates. It does not provide a patch editor for the Xiosynth's internal synth engine (although a basic patch librarian is included). Behind the scenes, the MIDI functionality of the Xiosynth is almost identical to that of the Remote LE (see the Remote LE review in the October 2006 edition of SOS), so there's no need to go into too much depth here. In 'Synth' mode, the Xiosynth is a three-oscillator subtractive synth. 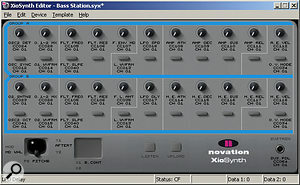 The synthesis engine is apparently derived from Novation's more up-market X-Station range, although somewhat simplified. The Xiosynth is eight-note polyphonic, but monotimbral, meaning that only one patch can be played or triggered at a time. The three oscillators each offer a choice of four traditional 'analogue' waveforms (Sine, Triangle, Sawtooth, Square/Pulse), four noise types (White Noise, HP Noise, BP Noise, HBP Noise), and nine sampled waveforms (Organ, Harpsichord, Elecpiano, Slap Bass, 'Rhod' Piano, 'Rhod' Tine, 'Whurly' EP, Clavinet and 'Ana' Bass). The sampled waveforms are a nice addition. If you dial up the default 'init' patch and switch the oscillator waveform to 'organ', you'll get something that sounds quite a lot like a playable organ patch right away! The others are a bit less forgiving when heard 'raw', but they're very useful as harmonically interesting starting points for creating new patches, which is really what they're for. The oscillators can be configured in several different ways, in addition to the basic layering and mixing you would expect. Oscillators 1 and 2 can be either sync'd or ring modulated, to create a wide variety of metallic, discordant tones and textures, and Oscillator 3 can be frequency modulated by Oscillator 2, for yet more tonal variation. The starting phase of each oscillator can be adjusted, so you can choose whether the waveform starts from zero with each note-on, or picks up from later in the cycle. Another interesting feature is 'VCO Drift' which, when activated, causes the oscillator to drift slightly out of tune, in an imitation of an overheating analogue synth. The oscillator output is passed to the filter section, which is a single multi-mode (high-, low- or band-pass) resonant filter, switchable between a 12dB and 24dB filter slope. In addition to the standard cutoff and resonance parameters, there's also a filter distortion control for adding extra 'grit', and a 'Shape' control, which boosts harmonics and emphasises filter distortion. There are two LFOs: LFO1 modulates oscillator parameters, while LFO2 modulates filter parameters. Both can be sync'd to external MIDI clock. In addition to the usual sine, sawtooth and sample-and-hold waveforms, there are some more outlandish options, including 'Chromatic', 'Major Modes' and 'Major Seventh', which can used to trigger scale patterns from a single note. The envelope section features a straightforward ADSR amplitude envelope and a modulation envelope that can be patched to oscillator pitch, pulse width and filter frequency, with independent settings in each case. Finally, there's an Attack/Decay envelope, which is used to modulate Oscillator 3, thereby controlling the FM amount. X-Gator is a 'trance gate' effect that rhythmically mutes or attenuates the synth's volume, to create stuttering, fluttering patterns. It's driven by an internal 32-step sequencer, which is presented as a small, two-row bar graph in the Xiosynth's LCD, where the level of each step can be adjusted independently. The X-Gator can be sync'd to MIDI clock, keeping things in time with your host application. The Arp is a flexible arpeggiator, which can also be sync'd to MIDI clock. Its output can be quite complex, playing sequences of ascending, descending and random patterns, spanning one to four octaves, following any of 32 preset rhythmic phrases. The arpeggiator can drive the internal synth engine, external MIDI sound sources, or both together. Finally, there's an Effects section, providing a simple but effective stereo multi-effects processor, offering Delay, Reverb, Chorus/Phaser, Distortion, EQ and auto-panning. The effects are all fairly basic, but sound good and allow a reasonable amount of editing. The Xiosynth comes with 200 preset patches, divided into two banks. There are no distinct 'user' patch locations, so storing your own creations means overwriting the presets. However, the patch librarian function in the template editor makes it easy to back up and restore banks and patches, so nothing need be lost forever. The presets provide a pretty representative sample of the sounds the synth is best at. Big, fat 'analogue' basses and leads are very much in evidence, many of them making good use of the distortion available in the filter and effects sections. Producers of harder-edged dance and electronic styles will find plenty to enjoy. There are quieter, gentler sounds on offer too, including some very nice pad sounds, ranging from straightforward synth strings to much more complex, evolving, ambient pads. Some of these are genuinely atmospheric and do a good job of demonstrating the range and quality of results that can be achieved with careful programming. There are quite a few single-hit percussion and FX sounds thrown in too, including a couple of quite convincing imitations of vintage drum-machine sounds. There's also a handful of patches that demonstrate the kinds of repeating rhythmic and melodic patterns that can be produced by experimenting with the Xiosynth's Arp, X-Gator and LFOs. Although I did struggle a bit at first, once I'd had a chance to get used to the system of menus I enjoyed programming new patches on the Xiosynth very much. It's easy to come up with good, solid, useable sounds, and digging a bit deeper can result in some interesting surprises. Time spent learning the ropes does pay off. The Xiosynth's capabilities as an audio interface are basic, but nonetheless useful. The quarter-inch input can be used for guitars, basses, dynamic mics and so on, while the XLR is suitable for condenser mics. The phantom power voltage is switchable down to 12 or 24 Volts, so if you're using a mic that can get by on less than 48V, you can reduce the overall power consumption slightly (which might be a useful bonus if you're running the Xiosynth from a battery-powered laptop). When in Play mode, and connected to a USB port, the Xiosynth's synth output can also be recorded directly across the USB connection, simply by selecting 'Xiosynth' as the recording input in your host software. The stereo quarter-inch line outputs are straightforward enough, and have their own level knob on the front panel. These outputs can be used to monitor the internal synth sounds and the output of any software that has Xiosynth selected as its output device. The Xiosynth may not be a do-it-all workstation, but it's a surprisingly flexible synth, capable of satisfying warmth, grit, and texture. The MIDI-sync'able X-Gator and Arp functions are good fun, and offer some interesting creative possibilities. Novation have done well to cram so much into such a small package — but in doing so they've inevitably had to make some compromises. The Xiosynth's panel is small, a bit cramped, and can be confusing for a new user. Each knob and button seems to have at least two different functions, and many of the synth's more interesting features are hidden away in menus accessible only via the clear and brightly lit but undeniably small LCD screen. To be fair, the layout is quite logical, and the most important parameters are quite easily tweakable. Even so, this is not a synth where a patch's settings are visible at a glance. When you want to fine-tune things, you have to go digging in the menus — and possibly reaching for your print-out of the PDF User Guide. While I'm being critical, I also can't help feeling that there are a couple of missed opportunities in the Xiosynth's design. What we have here is a synth with two built-in audio inputs, a good internal effects processor and nice, fat resonant filters. If you're a regular Sound On Sound reader, chances are that a question will already have occurred to you. The answer is 'no': it isn't possible to process external signals with the Xiosynth's effects or filters. These criticisms do need to be seen in context, though. While its interface may be a little opaque, this is simply a consequence of the Xiosynth's extremely compact and portable design. It may not offer every single feature on my personal wish-list, but it's very reasonably priced and certainly offers a lot for the money. Assignable knobs, buttons and X/Y touchpad. Good-sounding synth for leads, pads and basses. Audio interface with switchable phantom power. The user interface is a bit complicated. No processing of external signals. Novation give you a lot for your money with the Xiosynth: a powerful, compact MIDI controller, a good-sounding analogue-style synth, and a useable USB audio interface with phantom power. It all works as advertised, and if you're looking to build a portable or compact computer-based studio on a budget, it might be just what you need. 25-key version £229; 49-key version £299. Prices include VAT.